Tomorrow is thanksgiving so we decided to start our sale of Black Friday through Cyber Monday with 30% off the whole website. Its getting cold out so instead of wearing cotton hats that strips your hair of moisture thereby causing breakage & hair loss, purchase our satin/silk lined beanie that will not only keep you warm this winter but also help to keep your hair’s much needed moisture intact, amongst other benefits! I honestly don’t know how I made it through this week but thank Gawwwwd its over! We’ve just turned our clocks back by an hour for daylight savings.. or is it daylight spending? Is there even such a thing? Whatever its called, we sha have turned our clock back an hour, which is pretty much is indicative of the cold season approaching or that it’s already here ( Sorry I’m ridiculously confused today). I digress.. So anyway I thought I’d share with you guys some really good tips to help your hair thrive in these coming months. Check out the list below. Will you be trying any of these tips? Natural Hair Event: Let Me School You! 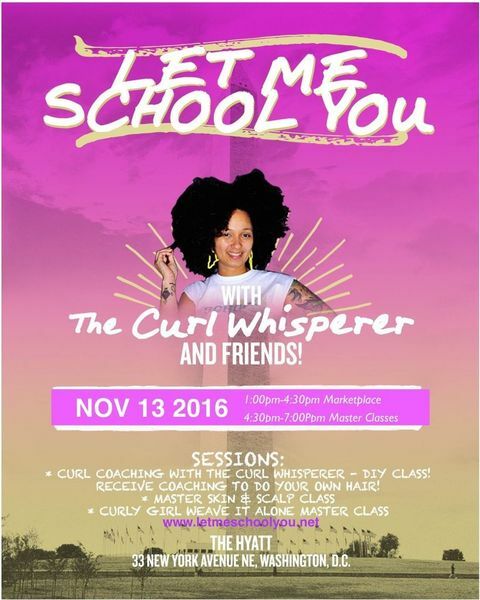 THE HOT TICKET TO LET ME SCHOOL YOU D.C. WITH THE CURL WHISPERER! Ask Karen of Karen’s Body Beautiful ! & Weave It Alone On Loc! New Website: New Colors In Stock! Check us out & let me know what you guys think!